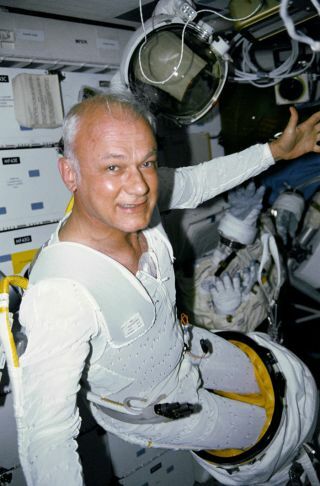 Astronaut Bruce McCandless II exits the EMU after successful deployment of the Hubble Space Telescope in 1990. In this historical photo from the U.S. space agency, STS-31 Mission Specialist Bruce McCandless II, wearing liquid cooling and ventilation garment (LCVG), works his way out of the extravehicular mobility unit (EMU) lower torso on the mid deck of Discovery. McCandless was in a standby mode to perform a spacewalk if needed to support Hubble Space Telescope (HST) deployment and post-deployment tasks on April 25, 1990. The deployment of the telescope was executed flawlessly, and McCandless' assistance was not needed.